We thank you from the bottom of our hearts for doing your bit. A special thank you note in online texts related to the project. A special thank you note in online texts related to the project and a digital submission from the report of the experience. A special thank you note in online texts related to the project and a digital submission from the report of the experience and the created texts. 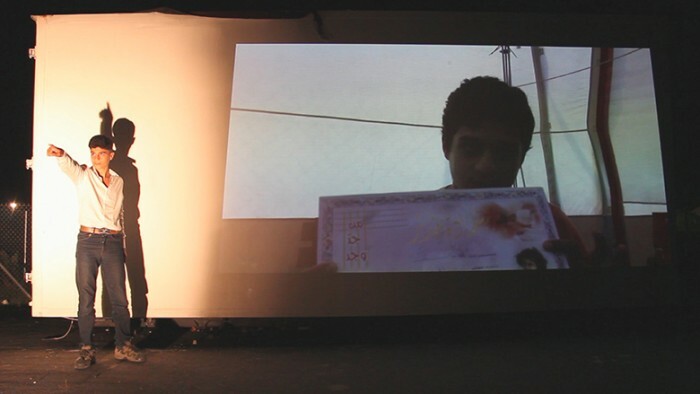 A special thank you note in online texts related to the project and a digital submission from the report of the experience, the created texts and audio-visuals. A special thank you note in online texts related to the project and a digital submission from the report of the experience, the created texts and audio-visuals of the process and it’s results. A special thank you note in online texts related to the project, a digital submission from the report of the experience, the created texts and audio-visuals of the process and it’s results and a special thank you note in printed texts related to the project “I is you”, which includes some of the results of the project. A special thank you note in online texts related to the project, a digital submission from the report of the experience, the created texts and audio-visuals of the process and it’s results and a special thank you note in printed texts related to the project “I is you”, which includes some of the results of the project, and a shipment of this printed material. A special thank you note in online texts related to the project, a digital submission from the report of the experience, the created texts and audio-visuals of the process and it’s results and a special thank you note in printed texts related to the project “I is you”, which includes some of the results of the project, and a shipment of this printed material as well as of an exclusive creation submission. Car rental and gas costs to reach the camps, distanced from each other and away from public transport. Minimum materials for workshops and performances, such as fabrics, plastics, papers, etc. BACKGROUND: IF EUROPE CAN’T DO IT, HOW COULD GREECE DO IT? According to some data provided by the UNHCR, in November, 2016, there are 9.318 refugees spread across 13 provisional camps in Central Macedonia, Greece. Most of these people have been there for almost one year, waiting in the slow political application process for asylum in European countries, without a guarantee of this being approved. They often have to wait for more than six months between one appointment and the next one. Meanwhile, most of the funds for migration policies of the European Union are intended to reinforce its borders. According to the independent agency CTXT, between 2007 and 2013, the European Union allocated almost three times as much of its resources on protecting its borders as it did on protecting the refuge; only 17, 5% of the total amount was used to improve the asylum procedures, shelter, resettlement and integration of refugees. Greece is the country with the biggest economic crisis in Europe and about 50.000 refugees were stuck there, after the border closure of their neighbouring countries. 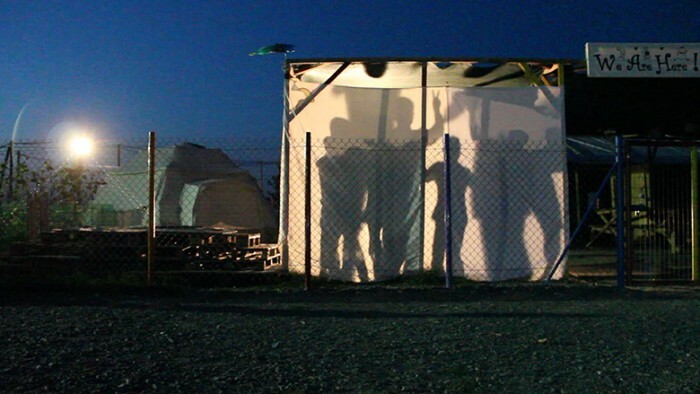 The stranded people in the Greek military camps barely receive the minimum necessary for subsistence. They have been old news for a long time and yet they are still there, away from the world, hoping to be accepted, anywhere, and without the chance of reconstructing their lives with some dignity; dying a little every day; not to mention the 30.969 people who, according to the last update of the consortium of journalists Migrant Files, have lost their lives while trying to get to Europe. In addition to the use of time in a creative and productive fashion, in the collective creation one’s own material is at the service of something bigger, reinforcing the value of the community, which ends up being very beneficial in situations of forced coexistence. The proposed creative process takes games and corporal movement as a starting point. The latter helps the body to break free from the traumatic situations experienced and the psychological and emotional stress that are a result of living in a refugee camp. Besides, it enables the unconscious expression of emotions and feelings, raw material of creativity. The ludic space opens the door to a dimension of freedom and fun, both necessary and scarce in the circumstances in the camps. Playing and allowing oneself to exist in a different manner enhances, in a very concrete way, the possibility of reinventing oneself and finding new unthinkable solutions to known problems. 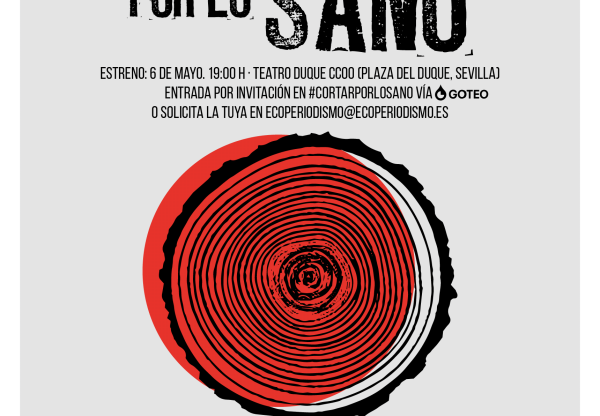 The proposals promote the incorporation of elements of the participants’ cultures to preserve them and give them value. Besides enriching the creative proposals, in situations of rootlessness and weakened identities, it is important and beneficial to nurture the link with the culture of origin. 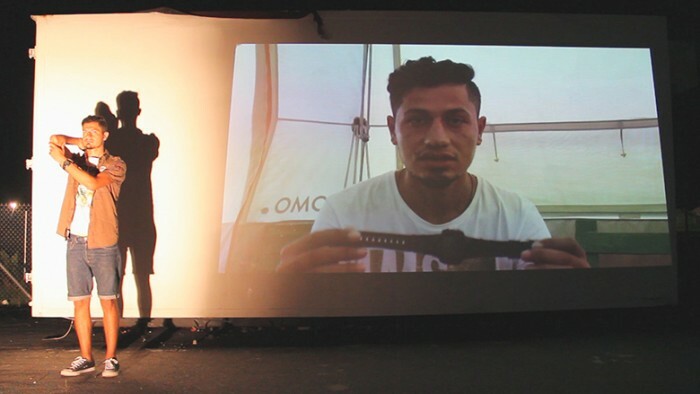 The importance of showing the results of the creative process in the situation of the people in refugee camps is evident: They really need to be able to tell their stories, motivations, frustrated expectations and dreams, of being heard and seen. But this mise en scene is not only beneficial for them. It also gives us back a cruel image of our ruthless mercantile societies, which could be useful for unmasking them. Eventually this would give us the chance of eradicating extermination among human beings. Some of the resulting materials of the project, such as texts, actions, photos and videos, will be part of the multimedia performance “I is you” (hej, jeg er dig) which will be premiered in Denmark in June, 2017 and which later will be staged in several European cities. Besides, the performance starts a dialogue with the public to reveal and question some of the mechanisms of construction of one’s own identity and the coexistence with others and in this way it fuels the desire of reinventing possible inclusive alternatives, free of the tyranny of the fear of the other. 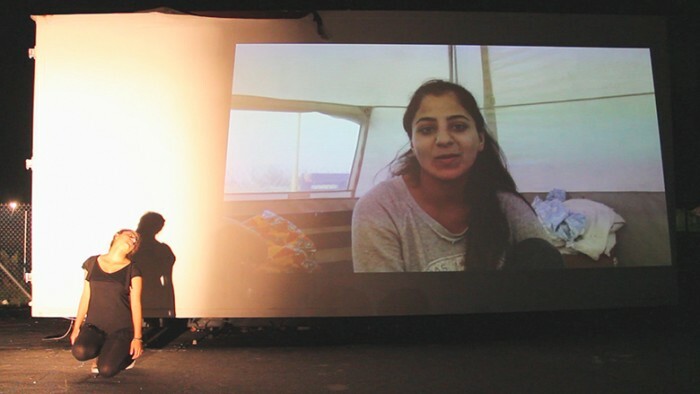 The project of Barcelona, Paramythádes, sowed the first seeds of this project when its members spent two weeks in refugee camps in the Peripheral Unit of Kilkis, Greece, with their workshops and performances of drama, music and dance, in August 2016. In the camp of Nea Kavala the children and youth who participated in the project, formed, with lots of enthusiasm, a theater group they named Escosirak. I, Paulina Tovo, had the opportunity to work with the project Paramythádes and once it was over, I continued coordinating the creative work with the group Escosirak during August and September 2016. 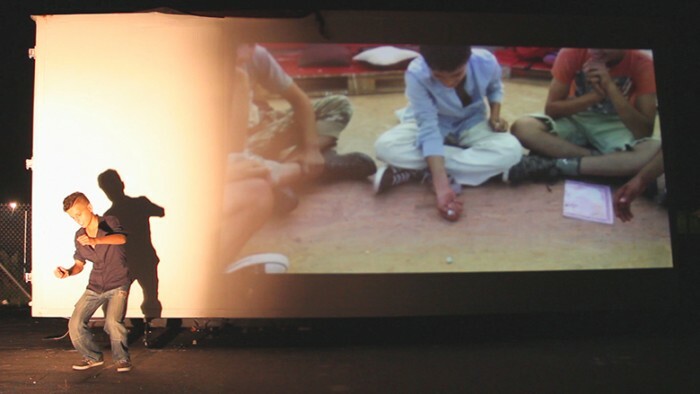 The aim of its participants was to make a performance in which they could tell their stories. I provided them with dramatic creation tools, in continuation with the previous work of Paramythádes, integrating the personal motivations of the participants and coordinating the mise en scene. That was how we made a composition with video, audio, songs, movement sequences, dramatization of dreams, and actions that became a 15-minute performance. All the stages of the work where complemented and supported by two of the most perseverant volunteers in the camp of Nea Kavala: Isabel Fernández and Chrissie Gefahr Brunton. 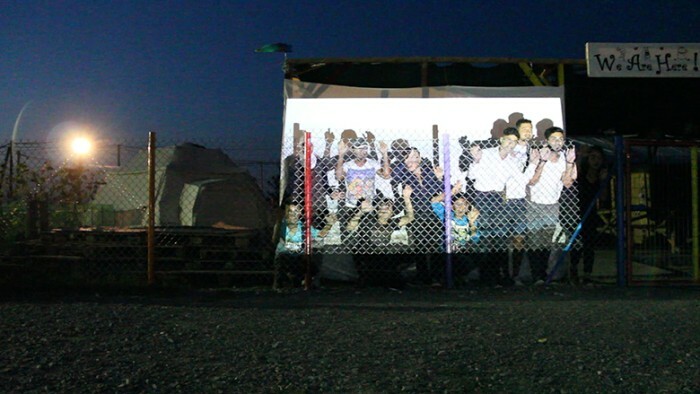 They have been working constantly for many months in several Greek refugee camps, and, among hundreds of undertakings, they bring logistics and creativity to all the cultural initiatives that reach the camps. This project, coordinated by me, will be carried out from the middle of February until the end of April 2017. It includes a continuation of the work done with the group Escosirak and is still in close collaboration with Isabel Fernández, Chrissie Gefahr Brunton and the project Paramythádes. Moreover, it aims to extend the proposal to other camps in Central Macedonia and to collaborate with the volunteers who perform artistic activities in each camp. I have already contacted several camps in the area and in January 2017 I am going to visit these and others, to finish dyfining in which the project will be carried out. The documentarian Isabel Andrés Portí is part of the working team and it would be very enriching for the project to have her come to the camps for two weeks to conduct interviews and to produce video material. If we do not cover expenses, she would be doing distance collaboration. In addition to the creation of scenic and documentary material that we can develop together, the aim is that the mise en scene keeps including the motivations and particular activities of the participants from each place. The living conditions in the camps do not deserve to be called humane: living in tents without any warm water or electricity, with shared chemical bathrooms, with an extremely poor diet, and without access to natural resources. Their inhabitants do not have a home; they are not seen, and are, at best, considered a problem and generally a threat. If they leave the camps, they become illegal. They do not have rights, voice, or opportunities; just an endless time ahead, and around them many in the same situation. In front of them, a massive wall that divides people into categories and that is always reminding them they belong to that of the subhuman. The civilian response is far more praiseworthy than the decisions of our politicians: Thanks to the work of thousands of volunteers, among many other things, community spaces in which recreational, educational, and cultural activities take place have been built in the camps. These activities reinforce social ties, and restore and promote human core values. And so, the actions of the volunteers keep the feeble flame of hope of thousands and thousands of people who have lost everything alive. 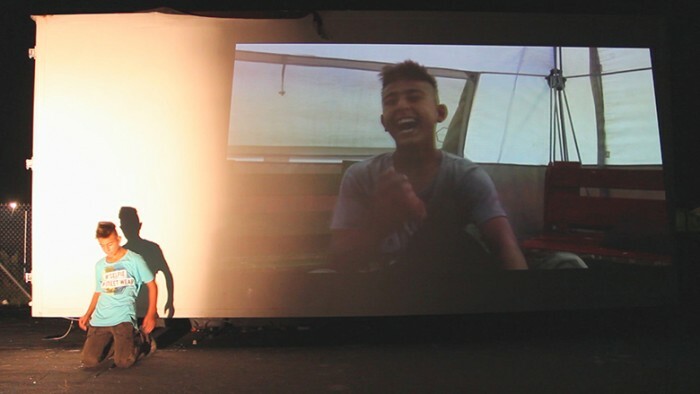 This proposal extends to all those in refugee camps who are willing to enter into a creative process of scenic expression (they don’t necessarily have to be on stage). The characteristics of the groups that are formed and their functioning will depend on the particular demands of its members. The objective of this campaign is to be able to cover both the minimum expenses of transfer and maintenance necessary to carry out the project as the costs of basic materials for the creation and staging of its results. It is also an easy opportunity to be able to support the cause of the refugees for those who want but do not have the time or possibility to act otherwise. I am creative in performance art specialised in the use of installation, audio-visuals and in the search of new scenic languages. I have trained as an actress in Stanislawski’s Method of Physical Actions, specializing myself in physical theatre, dance and voice. Also I trained in Performance and Multimedia at The Danish National School of Performing Arts. I currently create projects in collaboration with artists from other fields, collaborate in artistic, social and educational projects as an actress, dancer and director and I teach breathing, voice and dance techniques. Among other places I have presented my projects at the CPH-Stage and Dage med Brecht festivals, in Teaterøen, Copenhagen, Baggårdsteatret, Svenborg, Teatro Albeitar, León and CeCuCa, Cardedeu. I have also performed at the Foreign Affairs and Händel Halle festivals, in Berliner Ensemble and Radialsystem, Berlin, Goethe-Theater, Bad Lauchstädt and Theater Winterthur. I have worked with directors such as Leander Haußmann, Roger Bernat, Eugenio Barba and Aernout Mik. Filmmaker and creative writer with an educational background in History of Art at the University of Barcelona, Film and Television Screenplay at the Writers Workshop Foundation in Barcelona and EICTV in Cuba, Film History and Theory at the British Film Institute and also trained in Film Direction at Raindance Training, London. Around fifteen years of professional experience in filmmaking. Focusing last years on visual research, film directing and writing. Main interests are documentaries and multimedia art projects. Recently granted by EACEA Media Slate Funding 2016 and ICEC – Catalan Institute for the cultural companies- for the development of a documentary film. Currently working as author of two first episodes of ZDFinfo TV documentary series about Franco, Spanish dictator, in postproduction. Originally from Barcelona, based in Berlin and worked in London and Rome too. "Since July 2016 we have carried out our actions within the educational and community project “We Are Here”, totally independent from large NGOs and institutions. The work we are developing focuses on creating, developing, coordinating and supporting educational, cultural and sports activities aimed at children and adults. Our main objective is to facilitate the first step of their integration into the European states, to create a sense of community, to provide them with the tools to be able to develop autonomously and, above all, to restore in some way the dignity that was taken from them by being treated as animals by a few Institutions that turned their backs on them. The space of creation, freedom and fun that the project proposes brings to its participants the possibility of freeing themselves from traumatic situations, of developing creativity and individual potential, of expressing themselves, of being heard and seen and of reinforcing community ties. In short, it gives back some of the dignity and humanity that the circumstances of the camps take daily away from them. Translations of Arabic and Kurdish texts into Spanish, English and Danish.